Why should you let Ben Stein tell you how to live? Who's he to say what's what? The reason you should listen to Ben Stein is, quite simply, he says a lot of smart stuff about many different things. He's the wise old owl perched in a tree, waiting to answer all of your questions about life, marriage, work, and money. Delivered with the dry, honest wit that millions of people have come to know and love, Ben Stein shares his advice on nearly every topic imaginable, from the importance of being a loving spouse to the folly of supply-side economics. Understand the value of punctuality, sleep, and diversification. Let his wisdom guide you in coping with loss, feelings of despair, and national deficits. Stein's experience from Washington to Hollywoodand everywhere in betweenmakes him an ideal individual to offer guidance to others. His expertise in countless fields substantiates his keen observations on the range of challenges that people face every day. 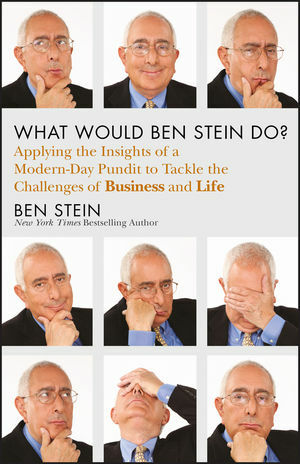 What Would Ben Stein Do? Well, he would read this book. Learn something new and useful from Ben Stein today.